Academic performance improves when students have a healthy sense of self and clarity of purpose. When students think deeply about themselves and have strong beliefs and values. Our teens confront critical choices daily. 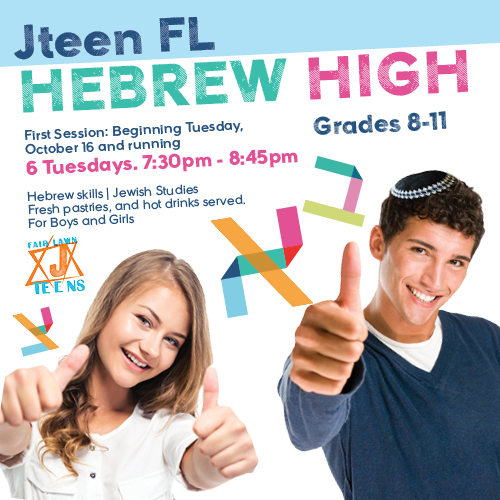 Hebrew High takes 3,000 years of Torah knowledge and makes it relevant to teens. Will your teens go to College? Be ready to speak up for Israel in school, college and everywhere in between. Make sure they know how to defend themselves with educated answers. In the upcoming semester titled "In Love with Israel" Rabbi Mendel will lead teen discussion and ask the unpopular tough questions that teens need to hear to stimulate thought and encourage finding truth. Each lesson is packed with eye opening information relevant to modern and ancient Israel. In addition, each lesson will also serve as a model for dealing modern social issues that teens face everyday. Each lesson also comes along with Hebrew skills, fresh pastries and hot/cold drinks. Why do we care so much about Israel, and does the world really care that much? Why is Israel a holy land, and why does it matter? Why does Israel belong to the Jews, and is being Israeli and Jewish the same thing? Peace in the middle east, fact or fiction? Is Israel destined to be normal or extraordinary, and Why? Israel and the Jew! No matter what, where and who! Attend first semester and save 50% ($75) on second semester.